A. Romi Cohen was a precocious, active 10-year old when the Nazis invaded Poland. Soon afterward, they and their puppet regime took over his native Czechoslovakia, and for the next five years he was a hunted fugitive and a valiant fighter with the partisans. 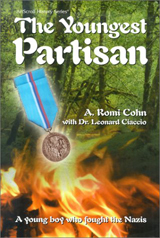 This memoir is a roller coaster of excitement and emotion, as young Romi is separated from his mother, risks his life to save his father and others, crosses borders, flees for his life with bullets flying all around him, races through Budapest desperately trying to save his father from Auschwitz, turns and fights, is inducted into the partisans, and participates in successful battles against the Nazis.